This is a list of glitches in the game Donkey Kong 64. With Donkey Kong, simply run and use his grounded kick attack, jump and then do his midair attack. This allows him to move a good distance through the air, almost as far as Tiny Kong's Ponytail Twirl can. With Donkey Kong, run up a steep, non-slippery slope and use his midair attack ( → ) while running. By timing his grounded kick attack correctly by pressing , he will fly very far and high into the air. This glitch allows for a wide variety of sequence breaks. When picking up any heavy object with Chunky Kong, go to a nearby wall with Chunky's back facing the wall and put down the object by pressing . When Chunky picks up the object again by pressing , he will take a step backwards and slightly clip through the wall. Without touching the control stick, pick up and put down the object until Chunky can go through the wall safely. This does not work on all walls however, and sometimes Chunky needs to jump while carrying the object so he can put it down again. With any Kong, run towards a ledge that isn't above a bottomless pit and hold the Button to crouch. If the player keeps crouching as they fall, no fall damage will be taken regardless how high they fall. An example of this glitch is doing it on DK Isles on the floating island were the entrance to Fungi Forest's lobby is located. With Donkey Kong, the player must go to the Rotating Puzzle Room in Crystal Caves. The player has to press the switch to the right of the room, then jump into the wall. If done successfully, DK should end up under the room. If he walks away he will end up at the beginning of the world. This glitch is quite tricky to do, but it works with all the Kongs and also before giving away all the required quantity of regular bananas. The player must stand near the edge of one of the stairs on the right side and use the Button right before they drop down a stair and turn the camera over to the stair and should see a black mark through it. If done correctly, the player should be able to walk under the stairs and head over to the door. The door will open/close the opposite way than normal and have floating numbers if using other Kongs or before giving away all the required regular bananas. The Frantic Factory boss fight against Mad Jack is tricky to do with the male Kongs, since Tiny Kong (who normally fights against this boss) has the Pony Tail Twirl ability to reach distant platforms and evade more easily. Also, while using them, the game may crash anytime while falling off platforms: the screen remains black while the music keeps going on. The player has to reset the console to play again. Mad Jack may also behave strangely if using any of the male Kongs, such as jumping diagonally across platforms, jump straight up on a platform he's already on or at the end of his chase sequence when the switches appear, only for them to disappear immediatelly. The Gloomy Galleon boss fight against Puftoss is the only one where the other Kongs can replace Lanky Kong (who normally fights against this boss) for the cutscenes, but will have Lanky's voice for those scenes as well. They will all copy all of Lanky's animation poses during the cutscenes as well. If Tiny Kong is being used for this boss, her pigtails will also move during the cutscenes. The Fungi Forest boss fight against Dogadon (normally fought by Chunky Kong) is impossible to defeat with the other Kongs as the Hunky Chunky Barrel (for the final blows) will remain translucent when Chunky is not being used. Also, Tiny Kong can pick up and throw barrels only during this glitch, and her voice clips during those actions is never used at all if playing the game normally. However, she cannot throw barrels as forcefully as the other Kongs, due to having the weakest physical strength. And unlike her sister Dixie Kong, she used her hands (like the other Kongs) instead of her hair to lift the barrels. Also, collecting the Boss Key after defeating the corresponding boss (with any Kong) will always count and then the portal to Scoff N' Troff will vanish. In Fungi Forest, there is a glitch that allows the player to enter the blocked off barn during the day. Chunky Kong is required and can use the Hunky Chunky barrel in the area with the Killer Tomatoe. Once the player returns to the main area, he or she should walk to the edge of the part where he or she puts the giant apple. The player then should walk along the edge closest to the wall; if done correctly, the player should walk through the wall. Once through the wall, the player walk forward a little bit and he or she will be in the locked off barn during the day. Donkey Kong can also enter the blocked of barn by moonkicking off of the roof of the waterwheel barn. In Jungle Japes, the player must go just outside the entrance to Funky's Store with Diddy Kong. On the wall to the right, there should be some flowers. If Diddy Kong aims his Chimpy Charge just to the left of the flowers, he should go right through the wall and successfully perform the Go Through the Mountain glitch. Using Chunky Kong, the player has to travel to Jungle Japes and enter the round area that contains a Hunky Chunky Barrel. This glitch is best performed while using the Infinite Crystal Coconut cheat from the main menu. In this area is a massive shell that only Tiny Kong can enter using her Mini-Monkey ability. If Chunky jumps at the point where the shell meets the wall, it is possible for him to fall through the level, and land in the caves that branch off beneath the level, leading to the clearing which houses Cranky Kong and his Lab. Chunky now has free reign of the level, and, as long as he doesn't return to the round area where he started or through any kind of scene transition, can travel anywhere in the level. It is also possible for this glitch to lead Chunky into being beneath the level itself, in an invisible body of water beneath the level's cliffs. Chunky can swim quite a distance here, but will eventually be stopped by a level boundary, and be forced to turn back. Swimming toward the main level and entering an area normally accessible to the other Kongs will allow Chunky to return to the level and play normally, albeit being huge. To perform this glitch the player must have Chunky standing on Banana Fairy Island, the player must then run towards the ocean and then quickly press and hold the control stick in the opposite direction until Chunky stops sliding. At this point Chunky will be able to swim under the island. After Chunky is under the island, the player can jump into the trapezoid-shaped object and will warp into the Banana Fairy Princess's room. In order to perform the Miss The Shot glitch, the player must go inside the Five-Doored Temple in Angry Aztec where Kroc says "Get Out" and gives them a time period to leave. The player must find an enemy and get hit by it with good timing. If the player times it right, the shot will miss and the clock will reset. The shot will also miss if Chunky Kong uses the shockwave attack on a dirt pile and picks up a 5-Banana Coin for the first time. The computers in the secret computer room. This glitch can only be done after completing the "Under Kong Isle" glitch. The player should first swim under the waterfall. Then swim to the green objects in the sky until he reaches the top of the water. The player must now make him swim around until he disappears. The player will have to move the camera around until appearing inside a room. Depending where he enters the room from, the player might have to jump onto the computers. He will now be inside the secret computer room. This room was used in the game for a cutscene, but was never meant to be playable. It can be accessed due to the model being stored under the island. The player must first Monkeyport to the top of Crocodile Isle with Tiny Kong, and then blow her saxophone on the saxophone pad. A Chunky Barrel will appear. The player will have to change into Chunky Kong and jump into the barrel to become huge. Chunky will have to go to the two huge stone steps leading up the island. The player has to make him first go to the second step then fall to the first step while holding the control stick towards the second. Chunky Kong should be under Kong Isle. If he walks away, he'll start to swim. This glitch also leads to a couple other glitches. There is an alternate way to perform the Under Kong Isle glitch. First, the player must go in the water in front of the Bananaport Pads, but not too far away. Then, the player must keep pressing B to do the Butterfly. If so, they go through the underwater ground (that is part of Kong Isle). If the player swims toward the waterfall, they can get to the Computer Room with any Kong. This glitch happens anytime the player completes Tiny Kong's race against the Mini Car in Frantic Factory, even if the player has already gotten its Golden Banana. After finishing the race, the main theme for Frantic Factory will start playing in the R&D Room, instead of the R&D Room's music track. The music will be restored back to normal if the player enters a Tag Barrel or exits the R&D Room and re-enters it. This glitch can be done with any Kong. Simply swim into the cave where all the treasure is located, dive underwater and swim back out to the shipwreck area. The music that plays in the caves of Gloomy Galleon will play instead of the music that plays when in either the shipwreck area or the lighthouse area. The music will be restored if the player swims back to the surface. The music will not be restored however, if Tiny Kong enters her Kong Barrel and then cancels her Mini-Monkey ability. The intro story glitch is activated by opening the cutscene menu in Mystery mode, and selecting the intro story cutscene. As soon as the player sees the screen turning blue, the player must press the button to cancel the cutscene. If they do it right, no music will be playing. If they do it wrong, they will have to replay the cutscene and cancel it again. The glitch will have many different effects on the game, depending on how it is used. When starting the cutscene, the player must also start a timer simultaneously, as keeping track of the time is important, because glitches associated with the Intro Story Glitch will otherwise not work. After the player activates the Intro Story Glitch, he or she must then view an empty Adventure mode file, but not start it. After going back to the main menu, the player needs to go to the Mystery menu and go to the Rambi Arena. The player then needs to start the minigame once the timer reaches 50 seconds. If done correctly, the cutscene that plays at the start of the minigame will be interrupted, and the player will be sent back to the Mystery menu. From there, the player needs to go to Kong Battle mode and start a 2-player Monkey Smash round. The match will get interrupted immediatelly, and then the player should go back to the Adventure mode game file they viewed earlier. There should be some game time registered on the file, but the amount has no effect on the glitch itself. When starting this file, the player will now have access to the Simian Slam, homing ammo as well as Funky's weapon for every Kong, even if they aren't rescued yet. Funky Kong will now only sell the two ammo belt upgrades for the Kongs, and Cranky Kong will still give away the Simian Slam potion after Donkey Kong completes the training barrels, and will give away the other moves as usual. After the Intro Story Glitch is activated, the player needs to go to a file were they haven't given K. Lumsy his first key, but still be able to visit the outside of DK Isles. After starting the file, the player needs to take enough damage to have only one melon slice left. Then the player needs to go back inside DK Isles and align themselves as close to the exit without leaving the area. As soon as the timer passes 3:25, the player needs to throw an orange grenade at the wall in front of them so the orange will knock the player to the exit. If done correctly, the cutscene that plays when giving the first key to K. Lumsy will play, and the lobby to Angry Aztec will be open for the rest of the game. If done wrong, the part of the intro cutscene where King K. Rool gives orders to his guards will play instead, meaning the player will have to restart the process again if they want to retry. If the glitch is done successfully, Army Dillo's first Boss Key can still be collected in Jungle Japes and will still count towards 101% completion, but it cannot be given to K. Lumsy to open the entrance to Angry Aztec's lobby. This is a simple glitch that uses Lanky Kong's move, his stretching arms. The player should walk up to any level entrance with B. Locker stopping the player's way. The player should choose Lanky Kong and go as close as he or she can to the DK portal and he or she should press three times. If done correctly, the player can gain premature access to any level guarded by B. Locker, except Hideout Helm. Donkey Kong can also do this using his standard attack, and Chunky Kong can do it using the Primate Punch. However, Donkey Kong cannot use his technique to enter Frantic Factory prematurely, but he can use another method. To enter Hideout Helm early, Diddy or Tiny Kong can go to either corners of the room were the entrance to the lobby is located and continuously backflip up the wall. They should eventually go through the wall, and can now walk to the loading zone behind B. Locker to enter Hideout Helm. With Donkey Kong, walk into the water far enough from the shore so he can dive, while also facing the lobby entrance. From here, dive and then mash the button to swim through the shore. Once past the shore, Donkey Kong can swim to the lobby entrance and jump into its loading zone. Run up on the steep slope below the entrance to the lobby of Crystal Caves, do a moonkick and aim for the ledge that is located just before the slope. Once Donkey Kong grabs the ledge, he needs to move slightly towards the left and can then climb up the ledge as normal, clip through the boulder and enter the lobby. The boulder is not solid from the inside, so it can be jumped out from. Stand on the ledge that is located behind the boulder with the Triangle Pad, and use the Ponytail Twirl to grab the center ledge. Tiny may have to move to the right after grabbing the ledge in order to clip through it. With Donkey Kong, go to the upper right corner of the temple in Angry Aztec were Tiny Kong is held captive. After facing the corners of the wall, continuously backflip into the corner. If done correctly, Donkey Kong should clip through the wall and be out of bounds. He can then simply walk to the cave were Cranky Kong is found, and continue through the level normally. If Donkey Kong goes too far out of bounds, he will be transported back to the beginning of the world. Below the platform on Crocodile Isle were Donkey Kong's Golden Banana next to a Coconut Switch is located, there is a small, steep hill. If Donkey Kong moonkicks here, he can grab the ledge of that platform, and from there, he can kickjump to the spiral path leading to Frantic Factory's lobby entrance. Although the door to the lobby is closed, Donkey Kong can simply walk right through it. When going inside Creepy Castle's museum with Chunky Kong, pick up the boulder in the statue's mouth and carry it over to the glass wall with a small factory behind it. By repeatedly putting the boulder down and picking it up again, Chunky can clip through the glass and be on the other side. He can do the same trick on the factory's walls and enter its loading zone. After beating the Mini Car, he receives the Golden Banana, and it will count towards his totals, not Tiny Kong's. This allows Chunky to have a total of 6/5 Golden Bananas, something only Tiny normally has in the game. Using the glitch to get past the boss door with any Kong in Creepy Castle, enter the battle against King Kut Out. The player will be able to use all the Kongs during this fight, even those they may not have rescued yet. If the player, for example, hasn't rescued Chunky, and makes him appear in the battle and then leaves the battle, Chunky will now be unlocked for the rest of the game. However, when leaving the battle, all of his color-coded collectibles (Banana Coins, Blueprints and normal bananas) will be invisible, so to fix this, he can jump into a Tag Barrel and go back out. This will not only make his collectibles visible, but the cage he would normally be locked inside in Frantic Factory will disappear, and the Golden Banana that would be rewarded for freeing him will spawn to its location as usual. This also applies to Tiny, Lanky and Diddy Kong. With Tiny Kong, Monkeyport to the top of Crocodile Isle and backflip up to a golden block next to the Pad. From there, Tiny can use her sliding kick attack ( + ), jump and use her Ponytail Twirl to reach the right side of the croc's snout. Once she lands there, she needs to do her normal ) attack to avoid slipping off of the snout. After she does this, she can jump and do her Ponytail Twirl again to reach the center part of the snout. Once there, she can walk over to the head's small eye and jump towards it. If done correctly, Tiny will go through the eye, and can then use her Ponytail Twirl to float to the lobby's loading zone. This glitch can be done with any Kong, but it works best with Donkey Kong. Simply use the glitch to get past the boss door, and after the fight with Dogadon starts, dodge the fireballs he spits, and after he lands to mock the player, carry the TNT Barrel to the right and put it down close to the edge. As Dogadon spits fireballs again, keep moving closer to the barrel, and after he spits the last one, roll towards the TNT Barrel and jump. If done correctly, a cutscene will play were Donkey Kong gets hurt, and he will also be giant-sized. The Boss Key however, may or may not spawn after defeating Dogadon this way, but if the key does not spawn, the player needs to restart the battle. After collecting the key, the player can give it to K. Lumsy as usual, and the portal to Troff and Scoff's room in both Angry Aztec and Fungi Forest will not disappear, allowing the player to obtain the second Boss Key the normal way. With Chunky Kong, go to the terminals to the left of the door in Hideout Helm were the entrance to King K. Rool's throne room is located. Chunky must then jump on the left side of the terminal, and if done correctly, he should end up inside the terminal. From there he needs to walk carefully towards the wall, as he will otherwise be pushed away from the terminal. Once past the wall, he can walk underneath the path leading to K. Rool's throne room, go behind the room were the final Boss Key is located and backflip into it to obtain the key. As he cannot exit the room normally, the player needs to exit the level through the pause menu. The purple and green second Bananaport Pad. The Bananaport Glitch is observed when the colors on the second Bananaport Pad on DK Isles will become randomly disoriented. Standing on it for an extended period will freeze the game. To perform the Wrinkly Door Glitch, the player must go to the Gloomy Galleon entrance and find the area where the blue and purple Wrinkly Doors are. Walk to one of the doors to talk to Wrinkly and quickly press B and move over to the other door. If the player is fast enough, Wrinkly will appear at the other door, but will not say anything. Also, the player is unable to move, meaning that they have essentially soft-locked the game. The only way to get out of this state is to reset the Nintendo 64. Donkey Kong 64 was not initially planned to require the Expansion Pak: the accessory was made required because there was a memory leak issue that caused the game to crash quickly and consistently when an Expansion Pak was not inserted . Making the Expansion Pak mandatory did not truly solve the glitch, but rather greatly slow down the rate at which the memory leak occurs, with the crash occurring after around 10 hours of uninterrupted play. While this is unlikely to be encountered under normal circumstances, playing the game using save states in an emulator or the Virtual Console's suspend save without exiting to the main menu (or simply leaving the game running for 10 hours or so, even on original hardware) may result in players encountering the memory leak crash. First, the player must perform the Under Kong Isle Glitch. Then, if the player keeps swimming until they get out of the island, there will be a blue spot on the ground. If the player swims there and then goes somewhere else, it will be as if they are on land. Then if the player takes out their gun and goes back to the blue spot, they will be swimming with their gun out. However, it cannot be fired. If the player gets out of the water, they will put away the gun. This glitch will only work with Lanky Kong or Tiny Kong. To perform the glitch the player must select one of the multiplayer maps that have water, then the player must take out their gun and walk into the water, if the player presses C-Up at the right time when jumping into the water, the kong will be swimming with their gun. If the player presses C-Up while swimming on the surface, they can fire their gun or throw Oranges. When the player presses C-Up again, the kong will put away their weapon. Once a player has collected all 40 Blueprints, Snide will give them the opportunity to play minigames in his hideout. The options that appear on screen allow for the player to view their collected Blueprints, exit the hideout, and play minigames, using the A, B, and Up C buttons respectively. If the player presses Up C, a menu will appear allowing the player to access the different minigames available. If A and B are pressed simultaneously on the minigame selection menu, the player will be transported to a test room containing several pillars that can be jumped on, as well as an unmoving model of Donkey Kong (although he blinks his eyes). 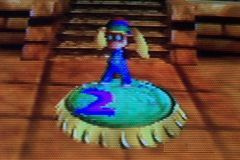 Also located in the Test Room is a yellow Banana Balloon that, if popped, will award the player 10 Bananas, regardless of how many have been collected in the level. If the player walks off of the platform, they will continue to walk through space until a scene change occurs. They will then appear back where they started in the room. The Test Room also lacks background music. Within the test room, the player is unable to pause the game. The only way to get out of the test room is to reset the Nintendo 64. This room was likely used for testing the game's physics when it was still in development, and the room was never removed from the final build of the game. ↑ Watts, Martin (May 28, 2013). Donkey Kong 64 Required Expansion Pak to Prevent Game-Breaking Bug. Nintendo Life. Retrieved December 1, 2016. This page was last edited on August 29, 2018, at 16:18.